Sauerkraut is the most well known German food. Sauerkraut is finely sliced green cabbage that has been fermented by lactic acid bacteria (Leuconostoc, Lactobacillus, and Pediococcus). The fermentation process (also known as pickling) gives the cabbage a distinct sour flavor, which is where it gets the name Sauerkraut (sour cabbage). Finished Sauerkraut can be purchased in many German food stores as well as in many markets. Sauerkraut can be eaten raw, which has many vitamins and minerals. However, if you are not used to the high amount of lacto-bacilli found in raw Sauerkraut, it can easily upset your stomach. For cooking suggestions, please see our Cooking Sauerkraut and Sauerkraut Recipes sections below. Raw sauerkraut is a very healthy food. It is both very low in fat and high in vitamin C. It is also a good source of lactobacillus - it has more than yoghurt! Sauerkraut is made by a process of pickling called lacto-fermentation. The bacteria and yeasts needed for the fermentation process are found on the cabbage leaves. No additional bacteria is added. 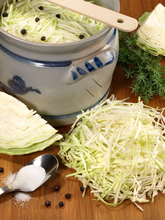 The process of making Sauerkraut begins by washing and finely slicing the white cabbage. The sliced cabbage is put into a large pot, a specific amount of salt is mixed in, and it is mashed with a cabbage masher. This allows the cabbage juices to be extracted from the cabbage. It produces enough to cover the cabbage in liquid. It is important for the cabbage to be completely covered in liquid to keep air out - any cabbage exposed to air would cause spoilage during the fermenation process. For Weinsauerkraut (Wine Sauerkraut), white wine is also added at this point. The cabbage is put into a large, covered, airtight container and allowed to ferment for 4 to 6 weeks. The bacteria and yeast begin the fermenation process. Over time, the lactic acid bacteria become active, converting the sugars in the cabbage into lactic acid. The Sauerkraut is ready when the desired "sourness" is obtained. Sauerkraut can keep for several months if it is stored in an airtight container and stored at or below 36°F (15°C). Refrigeration not required, but it greatly increases the shelf life of the Sauerkraut. Many commerical producers also use pasteurization to further increase its shelf life. The art of preserving vegetables through a lactic acid fermentation process (pickling) is a very old discovery. Preserving green cabbage this way was discovered by the Chinese in the year 221 BC. The Chinese needed to a way to provide good nutrition to the builders of the Great Wall of China during the winter months. So, they preserved cabbage by soaking it in rice wine. The tradition of pickling green cabbage was introduced into Europe in the 13th Century by the Mongolians, who brought the Chinese "Suan cai" (sour vegetable) with them. 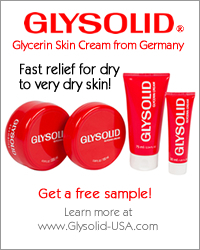 Its popularity began in Eastern Europe, then quickly spread throughout Western Europe. Once Sauerkraut is fully cured, it can keep for several months in an airtight container (See "How Sauerkraut is Made" to the left). Prior to refrigeration, people used the process of pickling to preserve green cabbage especially for the winter months. 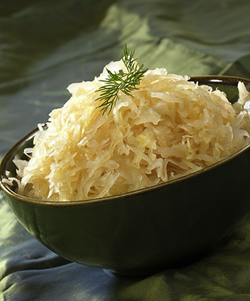 Through its high vitamin content (especially Vitamin C), Sauerkraut helped to prevent vitamin deficiency. In the 18th Century it was discovered that Sauerkraut was an effective cure for scurvy. Because of this, it became a favorite food for sea travelers, including Captain James Cook, who always took Sauerkraut with him on long sea voyages. Today, Sauerkraut is known throughout Europe and in many parts of the USA and Canada. A similar dish is also seen in China and Korea. Finished Sauerkraut can be purchased in many German food stores as well as in many markets. Sauerkraut can be eaten raw, which has many vitamins and minerals (see Nutritional Information section). However, if you are not used to the high amount of lacto-bacilli found in raw Sauerkraut, it can easily upset your stomach. Cooking Sauerkraut is very simple. Drain the Sauerkraut and rinse it if it is too salty. Add it to a large cooking pot. For every pound of Sauerkraut, add 3/4 cup of Riesling or other dry white wine. Bring to a boil, then turn the heat to very low and let the Sauerkraut simmer for one hour. If the Sauerkraut starts to become dry during cooking, add some water. Depending on your taste, onions, bacon, juniper berries, caraway, and/or cream can be added to and cooked with the Sauerkraut. In many parts of Germany, pork ribs or pork cutlets are cooked in the Sauerkraut to give it a smokey flavor. The pork absorbs the liquid and becomes very soft and juicy.